Wildly Using: Perfect Transportations Hanging Kit Decoration for Parties, Outdoor Picnics, Room Decoration, Baby Shower, Birthday Party, Photography Props. Transportation Home Decorations, it is easy to set up and perfect fit for outside or inside Parties, high quality card paper and Delicacy handmade cutting. Our Transportation hangings Kit is with high quality paper card, we have confidence with them, we would issue full refund if you are not satisfied with the Transportations set. 1. Each Transportation Hanging Swirl include 15 different Double Printed Transportations (3 Cars, 3 Trucks, 3 School Buses, 3 Ambulances, 3 Police Cars). 2. If any Problem about the Products, please Email Us, we will Try our best to solve for you, Thank you! 15 Pieces Double Printed Transportation Cards and 30 Plastic Swirls (As picture). 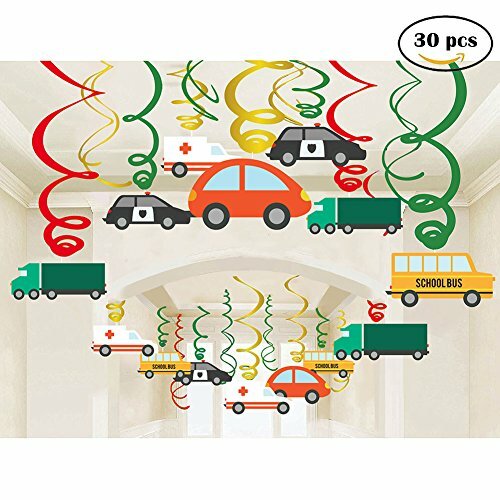 TRANSPORTATION THEMED DECORATIONS: Perfect Transportation Hangings Kit Decoration for Parties, Outdoor Picnics, Room Decoration, Baby Shower, Birthday Party, Photography Props. BUY WITH CONFIDENCE: You would be issued FULL REFUND guarantee if you are not satisfied with the animals set. If you have any questions about this product by Jiahai, contact us by completing and submitting the form below. If you are looking for a specif part number, please include it with your message.